When creating a new contract or editing an existing contract under Rights, the fifth tab that appears is Terms. Identifying rates, territories, services, formats and channels may be edited at any time. In this tab manage the terms of the contract for both digital and mechanical rights. Select the percentage of either retail (SRLP) or wholesale (PPD) sales you would like to assign. Confirm that territories (countries) you would like to either include or exclude within the scope of this contract. 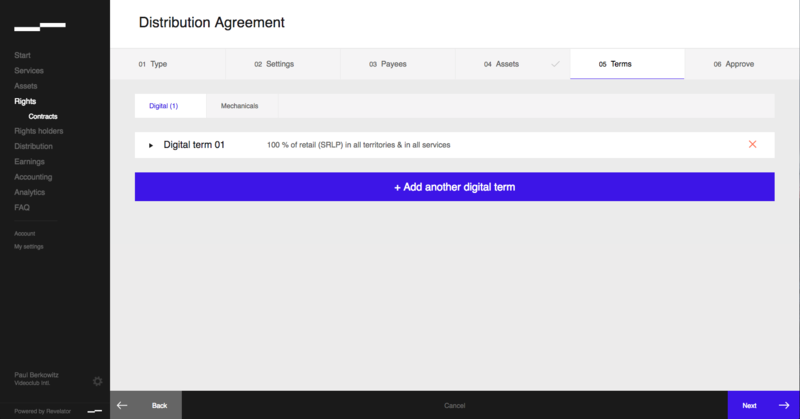 Select the services you would like to either include or exclude within this contract from the drop down menu. Select the release formats this contract will apply to. Select the channel or channels this contract will apply to. If there are additional terms you would like to include in this contract, repeat these steps for each one. When all terms have been entered, click Next to confirm your selections and continue.